“Ski fast, drive slow,” a friend-of-a-friend chuckles, as the rest of us cower in the backseat of a massive Chevy Silverado. Even with the weight of five twenty-somethings and their gear, the truck fishtails a bit as it navigates a snowy county road just outside Crested Butte, Colorado. Jagged peaks in the distance show untouched, salivation-worthy snow above the tree line. The air is a humid, cakey cold — the kind that makes you feel cocooned in a frosty wilderness. But when the road ends in a small clearing, next to a homemade terrain park, the place is packed: College kids from the next town over, dogs running after owners as they hit the jumps, and a couple of nine-year-old’s who, at the rate they’re going, could probably shoot for the 2026 Olympics. The modern ski bum faces two challenges: the reliability of income and the cost of housing. Up and down the Mountain West, some of the highest concentrations of service industry jobs are found in counties where the Big Ski is king: the waiters, hotel clerks and rental cashiers that make up the backbone of a resort economy. These wages are often subsidized with tips, which dry up when the tourists aren’t there. And ski-related injuries that turn into unexpected medical bills aren’t unusual. 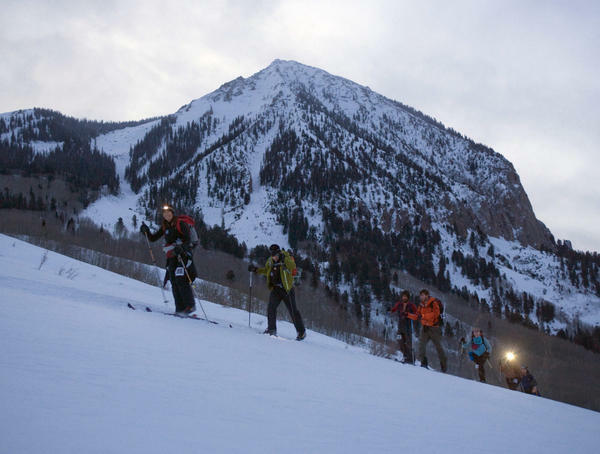 But earlier this year, corporate behemoth Vail Resorts announced that it would purchase Crested Butte, along with two mountains on the East Coast, in a deal that included $74 million and paying off the resort’s existing leases. Thomas, a self-described second-generation ski bum, grew up here, back when the roads weren’t fully paved and the former coal mining outpost still felt close to its roots. Her rent started at $375 a month when she first moved back to Crested Butte. Now it’s $825. Thomas says she worries Crested Butte will go the way of Aspen or Telluride, with the elite living in town and the workers commuting an hour or more. “Most of the businesses in this town are looking for work. But people can’t move here and work because there’s nowhere to live,” she said. Thomas works seasonally behind the desk at a construction firm and nights at a distillery, serving craft cocktails and steaming bowls of fancy ramen. It’s an uneasy balance, and one she maintains by hoarding wads of cash for the mud season. But it’s a life she’s committed to. Still, the ski bum’s resilience likely lies in their ability to adapt. Josh Painter, a snowboarder who cooks and serves tamales and burritos in a café, says that if things get too expensive or crowded, he’ll leave. Durrie Bouscaren (@durrieB) is a freelance journalist who grew up in Fort Collins, Colorado. Originally published by KUER on December 21, 2018 at 5:40 pm. This story was produced by the Mountain West News Bureau, a collaboration between Wyoming Public Media, Boise State Public Radio in Idaho, KUER in Salt Lake City and KRCC and KUNC in Colorado.